Cozy Lummox: Liar's Kiss hits stores this week! 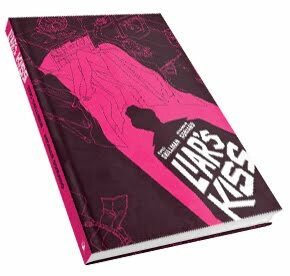 Just a quick post to bump this info back to the top of the page, given it's timeliness: Liar's Kiss hits stores this Wednesday! Obviously if you're any kind of regular reader here, I've talked this thing to death, but for those who want a little preview, the first few pages are here, and you can browse through a selection of my favorite panels if you scroll through the blog archives. And anyone in the New York area should consider themselves invited to the Release Party on Thursday, May 19th, at Desert Island in Williamsburg, Brookyn, 7-9 PM. Free beer! [Not free] books and hand-pulled silkscreens! Hope to see you there! Nice, just added to my "to buy" list. Good luck with the launch. The book was fantastic, great job by both you and Jhomar. A great book that I'm putting as my staff pick at our local library. I look forward to another! Also, thanks for all the awesome Criterion covers.